Illuminations from the attic: Rampart Ridge, A pilgrimage into the Alpine Lakes Wilderness. Rampart Ridge, A pilgrimage into the Alpine Lakes Wilderness. I'm a dreamer. I dream of mountains, lakes and meadows, deep forests and high peaks. In the dark months of winter such dreams are sweetest. Backpacking adventures will grow in my mind. I make lists, draw maps, memorize guide books and glue my eyes to Google Earth. Most plans fade into oblivion; some stay and morph with time. A recent expedition had been formulating since sometime last year — a five-day trip into the Alpine Lakes Wilderness, introducing my family to some of the most beautiful lakes in Washington. Over time, other responsibilities and bad weather shrank the trip to four days, then to three, then two, until it finally looked to have disappeared altogether. But suddenly, midway into October, the clouds parted and the sun shone. The forecast was for freezing temperatures, but with the sunshine, we decided it was now or never. Since the weather was bright but cold our packs where large and heavy, weighed down with winter clothes. My mother appeared to be carrying a large, blue hay bale on her back — which thoroughly impressed our fellow visitors! Many hikers make the pilgrimage to this wonderland, even in the last days of the hiking season, though none carried large packs. In summer the paved double parking lot — and the campsites at the lake — are probably filled to capacity. The trail up Box Creek to Rachel Lake was not formally built, but rather was beaten down by the weight of many feet. 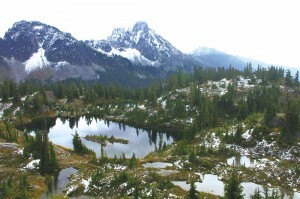 Before renowned guidebook authors and conservationists Harvey Manning and Ira Spring put the hike in their book "100 hikes in the Alpine Lakes," the valley was slated for logging. The flood of backpackers generated by the publicity saved the trees — and our hike 50 years later. We tried to play down the length of the hike; it is 4 miles long with 1,500 feet of elevation gain. The younger members of the family balk at anything over 3. The first 2 1/2 miles of the trail is an easy valley stroll through old-growth forest and sub-alpine meadows. In fall, the vine maples paint the forest vivid shades of yellow, orange and red. Many tantalizing views of the high country ahead are glimpsed from the beginning, and small waterfalls on Box Creek fill the forest with their lively tune. Everyone was energetic and enthusiastic until we reached the last third of the hike. Most of the elevation gain is encountered here, and it made the 4 miles feel like 8 as we crawled over uneven rocks and roots, always up. Many times our hopes soared and were dashed when we thought the lake was just around the bend. Our packs seemed to increas in weight as the elevation increased, and the little kids began contemplating ways of throwing their big brother in the lake if we should ever actually get there. But just when we thought we'd never make it, the elusive lake came into view. Even the moaners exclaimed that it was well worth this last tortuous mile, with the eastern shore a maze of boulders and beaches and fine campsites, and the west lined with picturesque cliffs. The kids were delighted with the curious "camp robbers" that patrolled the woods around the lake. Slightly tamer than your average household parrot, these gray jays would swoop down and alight on an outstretched hand. My little sister exclaimed, "It's just like having a bird land on your hand!" There is no limit to what these scavengers might gobble — a revelation that came to light as half a dozen birds wolfed down spilled mashed potatoes at dinner time. The day hikers were mostly gone from the lake by four in the afternoon, and we had the campground all to ourselves. Campfires aren't allowed within a half mile of the lake, so we made good use of our warm coats and didn't stay up stargazing for long. We woke to frosty ground, and the more intrepid of us donned our long johns and set off for the lakes that beckon from a mile above Rachel Lake. The real attraction here is Rampart Ridge, reached by a steep boot track that climbs up from Rachel Lake with stunning views of the lake, Box Creek, and Hibox Mountain across the valley. At the top of a long half-mile is a junction. The right fork leads to Lila Lakes and Alta Mountain. Lila Lakes are a mesmerizing collection of alpine tarns reflecting the cliffs of Hibox. There was already snow around the lake when we were there, juxtaposed against the bright reds and golds of the vine maple and huckleberry bushes. From near the lakes a second trail climbs to the top of 6,250 foot Alta Mountain from which the whole of the southern Alpine Lakes Wilderness may be taken in. The left fork is easier, and leads to the well-named Rampart Lakes - a dozen azure lakes tucked in granite bowls and reflecting the cliffs above. When we returned to camp, the children were playing on the sandy beaches under the watchful eyes of the camp robbers as my teenage brother read books on a sun-dappled boulder. Along the shoreline my father was fishing for elusive trout. In a few hours we would have to race the darkness home, perhaps regretting that we didn't have the four or five days there I would have liked. But now when we trudged back down the trail still wearing our winter clothes, we would carry down with us backpacks full of memories instead.